ABC Oakland Launches! Many events! 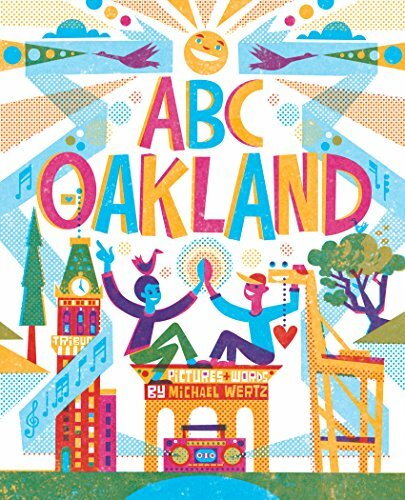 The release party for my new kids' book ABC Oakland is on April 29 at Oaklandish, 1444 Broadway (between 14th and 15th) from 5-7 pm. ABC Oakland is a collaborative venture between myself, Heyday, and Oaklandish. The Book is itself a celebration of Oakland, its iconic monuments, and its storied history, that is fun for younger audiences and adults alike. ABC Oakland highlights everything from famous streets and boulevard such as Broadway Avenue, to Children's Fairyland and other icons, to the Ohlone people, who have lived in what is modern-day Oakland since before Spanish colonization. Michael, Heyday and Oaklandish all wanted to make this book a fully educational body that simultaneously celebrates the Town's history and people. In order to make this book accessible to all of the Town's children, Oaklandish and Heyday are teaming up with the Oakland Unified School District to provide a copy of 'ABC Oakland' to every kindergarten classroom in the city! In addition to the book's release, I am teaming up with Oaklandish on a t-shirt collaboration that will be in-store the day of the event. Also: Meet me at Children's Fairyland on Saturday May 6 for Turn the Page, a children's book festival featuring 25 local artists and illustrators! I will be on hand to sign books all day, from 10-4. More ABC Oakland: A is for Aviary, a home for the birds; B is for Broadway, from College to Third. C is for Cranes standing tall in the sky; D is for Dogs, wagging tails, saying “hi!” On May 26 at 7 pm, I will be hosting a fun-filled PJ Party at Diesel Book’s Oakland location! Kids are encouraged to come ready to party in their PJs and excited for cookies and milk. Look for: Milk. Cookies. Drawing. Singing! Even more ABC Oakland: Laurel Books has generously offered to host another ABC Oakland event at their lovely shop right on Broadway and 14th Street on May 27 at 2:00 pm (which is the day after the Diesel event)! I have a feeling we'll be attempting to draw their beautiful building. Maybe I'll bring a bunch of sketchpads and we can walk around the building. There will probably be: Lots more Drawing. Even more Singing! See you at one (or more) of these events, and thanks! A silence fell over Wertz's social media presence. For months. What was it? What was happening? What is the sound of one page turning? It is a book. This book. ABC OAKLAND. A new kids' book for Heyday Books, written and illustrated by yours truly. It's been a long time in the making, and it's getting close to being finished. Here's a sneaky peek at a few of the images. I'm excited about this. Friendlies, I've been working pell-mell on a new project with author Betsy Franco. We collaborated previously on a kid's book about cats, then a kid's book about dogs. Guess what this new one is about? Dear Friendlies, there's a new Friendly in our midst. Lucy Sisman (who has an incredibly impressive roster of print clients) is working on a great literary blog called wwwword, and she asked if I'd like to be interviewed for their blog. The result? One of the nicest pieces of writing about my process to date, and an in-depth look at the creation of A Dazzling Display of Dogs. Dog Dreams opening at Book Shop Santa Cruz! Friendlies, we're getting the band back together again - again - for a singing and book signing at Bookshop Santa Cruz. This is one of my very favorite bookstores, and we're excited and grateful that they want to host and event with us. We have a long history with the town of Santa Cruz, and Bookshop is one of the best things about Santa Cruz. We always go there when we visit. Usually we go to Zachary's to fuel up, then down to Bookshop. It's a thing we do. So come on down, check out the surf, grab a book. Come say hi! WHAT: Dog Dreams singing/signing at BSSC WHERE: Bookshop Santa Cruz, 1520 Pacific Avenue, Santa Cruz, CA WHEN: January 19, 2012, 7:30 pm. Some video has emerged from the Dog Dreams opening at the Oakland Museum: here it is. It's super goofy.